Austrian mountaineer Mr Peter Maier takes multiple cameras with him since a few years whenever he makes a weekend walkabout into the Alps. 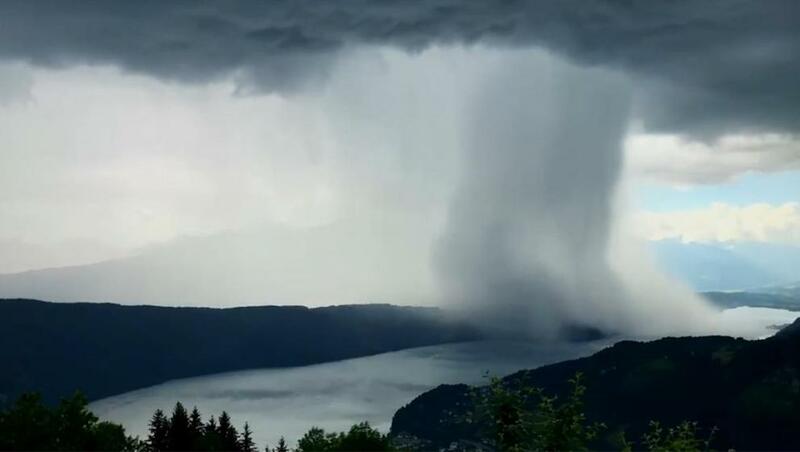 Earlier this week he was able to capture a so-called ‘downburst’ or ‘microburst’ when walking near the Millstätter See in his home country. Thanks to a time-lapsed video it makes for some spectacular sightseeing. During a downburst (or microburst) there is a very local, sudden change in the wind, where the air is suddenly accelerating very rapidly on it’s way to the earth's surface. In this case it seems like someone suddenly pours a bucket of water into the underlying mountain lake. The Millstäter lake, in the middle of the Austrian alps, has a length of 12 kilometers and is up to 1.5 kilometers wide. It lies at an altitude of about 600 meters. "A lucky shot", says the avid 27-year-old mountaineer who always has several cameras with him to capture the wonders of nature. "You cannot plan such a picture." In one week’s time, the images have already been viewed some 2 million times on Facebook which is why Mr Maier decided to create a timelapse video on Youtube. Although it looks beautiful, the weather phenomenon itself is one of the major dangers for aviation. Most aircraft are equipped with safety systems to warn pilots of wind shear when this phenomenon occurs.